The euro’s slow recovery against the US dollar from November’s 16½-month low appears to have stalled as the outlook for the Eurozone economy grows grimmer by the day with no sign yet that a turnaround is around the corner. Expectations that the European Central Bank will nevertheless press ahead with its plans to start raising rates later this year, along with a pullback in the greenback have been supporting the single currency until recently. However, with the ECB’s normalization plans now in question and the dollar recapturing some of its lost allure, the euro’s prospects in 2019 are not looking very positive. Two thousand and eighteen was not a good year for the Eurozone economy and 2019 is on course to be an even worse one as a rebound in growth becomes ever more elusive, possibly derailing the ECB’s plans to gradually tighten policy. Growth in the bloc’s largest economy, Germany, fell to 1.5% in 2018 from 2.2% in the previous year and is on path to slow even further in the first few months of 2019. Growth in France – the Eurozone’s second largest economy – is also expected to be very weak in the first quarter as the country has been hit hard by the ongoing ‘yellow vest’ protests, while the third largest economy, Italy, has officially entered recession after GDP contracted for the second straight quarter at the end of 2018. Further confirmation of the deteriorating trend came from the European Commission which this week sharply cut its growth forecasts for the bloc. Germany’s 2019 forecast was cut from 1.8% to 1.1%, and France’s from 1.6% to 1.3%. The most notable revision, though, was for Italy, whose growth projection was slashed from 1.2% to just 0.2%. As for the euro area, the Commission expects 2019 growth to slow to 1.3% from an estimated 1.8% in 2018. As the Eurozone’s economic engines grapple with sluggish growth, there’s not much else driving the rest of the region, especially as the global economy is also undergoing a deep slowdown. 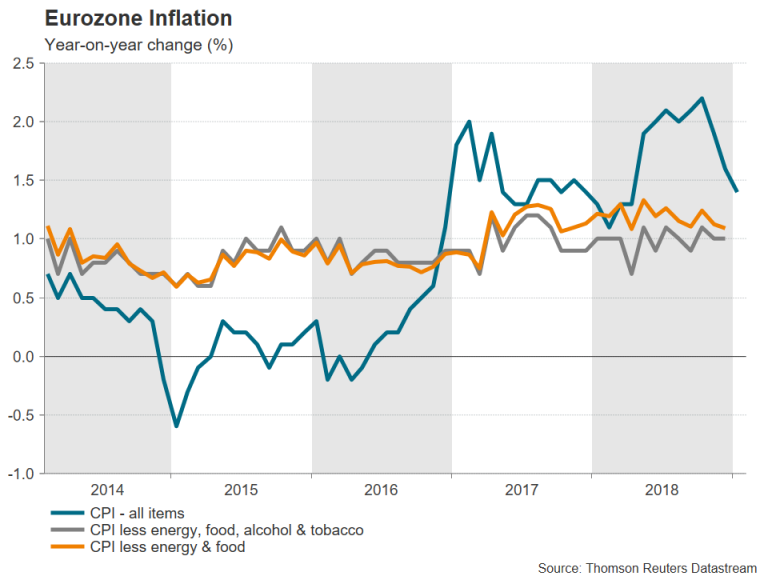 Adding to the ECB’s woes is falling inflation. The headline rate has declined substantially from the peak of 2.2% hit in October to 1.4% in January. It will likely fall further in the coming months following the recent slide in oil prices. More importantly though, underlying inflation has been flat for the past two years, with the two core measures hovering just above 1%. The improving labour market has been one bright spot in the economy, which has shown to be resilient against a weakening economic backdrop. Eurozone wage growth quickened to a 7-year high of 2.5% in the third quarter of 2018, as per last available data. However, the latest PMI report by IHS Markit pointed to slowing employment growth in January, meaning pay increases may begin to ease over the coming months. Without faster wage growth, the ECB would have a difficult time sticking with its projection that underlying inflation will soon begin to edge upwards. The central bank is probably all too aware of the growing risks to its anticipated build up in price pressures and paved the way for a possible downgrade to its growth and inflation forecasts by adopting a more downbeat tone at its last meeting in January. Revised forecasts will be published at the ECB’s next meeting on March 7. However, while downward revisions are likely, traders expecting any change to the Bank’s forward guidance may be disappointed. At present, the ECB’s timeline is for the first rate hike to arrive sometime after the summer. A push back of that timeline could place the euro under significantly stronger downside pressure, wiping out the key technical levels that are currently providing support. At the moment, euro/dollar appears to have formed floors around the $1.13 and $1.1265 levels, as well as the November trough of $1.1213. A breach of these supports is a strong possibility if the ECB began signalling that a shift in its forward guidance was forthcoming and that shelving plans to hike rates in 2019 was on the cards. However, the question about Mario Draghi’s successor might prevent the Bank from making any major changes to its outlook until at least after a new president has been selected. Draghi’s term ends on October 31. The selection process is not expected to start until after the election of a new European Parliament in late May. Until then, and in the absence of new guidance by the ECB, the euro might be able to hold above the key $1.12 handle. But of course, if by Spring, economic data continues to worsen, markets may completely price out a rate rise for 2019 even before the ECB adjusts its guidance. At the moment, traders are betting there’s a 50% probability of a 10-basis point rate hike by December. This suggests there’s plenty of scope for downside moves if those odds were to be erased over the next few months and euro/dollar could be headed for the $1.1115 support area in such a case. Although there are still hopes that global growth momentum could pick up speed later in the year, especially if the US and China strike a comprehensive trade deal, the risks are clearly tilted to the downside. European political headaches remain plenty – Brexit, the Italian budget row, French protests to mention a few – and may not disappear anytime soon, weighing on business sentiment for the foreseeable future. The lack of further structural reforms by Eurozone member states, which have become overly reliant on the ECB’s stimulus tap as they’ve opted to put off the tough decisions, is also holding back the bloc from achieving its potential output. 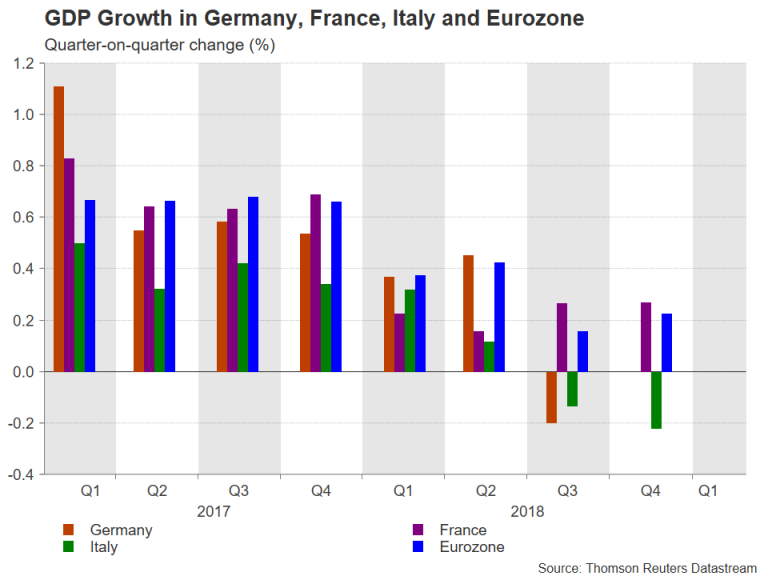 With growth in many euro area economies, including Germany, at or close to zero, it wouldn’t take much to push the region into an outright recession. Even a new trade accord between China and the US may not produce the desirable outcome for European manufacturers as the focus would then turn to EU-US trade differences. That’s not to say though, that the dark clouds currently casting a shadow over the continent and in much of the rest of the world would not recede and an upturn in growth could still materialise in the second half of 2019. If the growth picture was to improve substantially, a major test for the euro that would signal its fortunes are turning would be the $1.1708-1.1734 zone. This region could be critical as it encompasses a concentration of three 38.2% Fibonacci retracement levels: the downleg from $1.2555 to $1.1213, the uptrend from $1.0339 to $1.2555 and the down move from $1.3992 to $1.0339. Without a successful break above this area, the euro is unlikely to be able to forge a new longer-term bullish structure. Next articleHow Long Can I Hold the Position in Forex Trading?